CBC — Canadians already paying steep gas prices can add one more cost to their bill: forking over money for fuel they didn't receive. Government data obtained by CBC News shows that six per cent of all gas pumps tested over the past 2½ years failed to dispense the right amount of fuel. In about two-thirds of the faulty tests, customers bore the brunt of the error. The loss adds up to an average of a couple of dollars for every 50 tankfuls, the Automobile Protection Association estimates, but the total loss across Canada is in the millions. "If you can pick up pennies here and there, it adds up to real money and that's really our concern," says George Iny, director of public interest group Automobile Protection Association. Gas retailers overcharged consumers by nearly $20 million a year, and undercharged them by $12 million, according to Measurement Canada, based on 2008 figures. Saskatchewan rated the highest for overcharging customers when a pump was faulty, at 83 per cent. Tests in Ontario revealed seven per cent of gas pumps made mistakes, with 67 per cent of the faulty readings favouring the retailer. Four per cent of Alberta's tested pumps were faulty, favouring retailers 73 per cent of the time. Nova Scotia — where seven per cent of pumps dispensed the wrong amount — was the only province where faulty pumps actually favoured the consumer, at 54 per cent. An inaccurate pump in the tests equals a discrepancy of more than 100 mL over or under for 20 litres of gasoline. 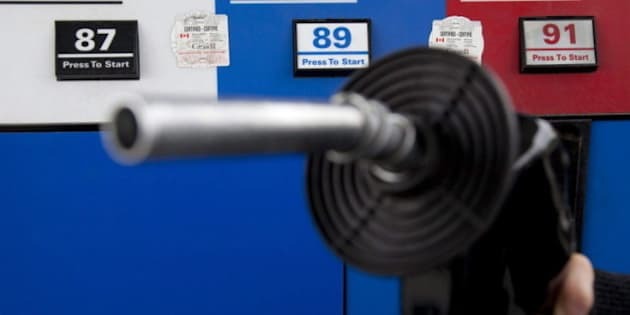 The problem of inaccurate gas pumps first surfaced in 2008 when media reports revealed that nearly five per cent of pumps tested between Jan. 1, 1999, and Aug. 28, 2007, shortchanged consumers, or one inaccurate pump every 20 times. The industry minister at the time, Jim Prentice, vowed to crack down on inaccurate pumps. He promised stiffer penalties and directed Measurement Canada, an agency that checks whether yields match the ticket price, to increase the frequency of pump inspections. The new rules are still not in effect. Industry Minister Christian Paradis was not available for comment. Since 2008, the number of inaccurate pumps shortchanging consumers dropped by one percentage point to four per cent. On average, motorists are now shortchanged once every 25 pumps, according to the latest government statistics. Once every 50 fill-ups, they receive more than what they paid for. But even though inspections have since increased, the problem persists. "It's still a significant amount of pumps that are out of range and they appear to be shorting consumers about twice as often as they give them too much gas," says Iny of the Automobile Protection Agency. "We feel that the money should be returned to the people who paid, either directly, if you have the evidence and are able to reach them, or indirectly if you can't do it that way." The agency is part of a class-action lawsuit against five gas retailers, accusing them of shortchanging consumers. The lawsuit is seeking certification. "It also shows a culture in the oil industry," says Iny. "Even with the results becoming public, even with a lawsuit, no oil company has offered, as far we know, to refund customers who paid too much. It's a strange culture." But one industry group says gasoline retailers have come under unfair scrutiny, noting their sector is among the most accurate. "We're really proud of the level of accuracy in which we dispense products," says Tricia Anderson, president and CEO of Canadian Independent Petroleum Marketers Association, a non-profit group that represents small and medium-sized gas retailers. "Of the various sectors that Measurement Canada is looking at, we have the highest compliance ratio, the highest ratio of accuracy." Anderson also notes that the sample size tested by Measurement Canada amounts to a small fraction of the billions of litres pumped annually across Canada. "Most retailers, certainly our members, are honest business people," said Anderson. "Frankly, the pumps go out of calibration as a result of wear and tear. And older pumps are more prone to that. If a mistake favours the consumer, Measurement Canada leaves the decision on whether to fix it in the hands of the owner. If the mistake takes money out of a consumer's pocket, the government agency hands out a "notice of non-compliance" requesting the owner repair the problem pump within 14 days. But if the pump shortchanges the consumer by more than 200 mL on 20 litres, the pump is ordered removed from service until fixed. Measurement Canada took 294 pumps out of service from the start of 2009 until May 1, 2011. Over 13,000 gas pumps were randomly checked annually in the past two years. A single case led to charges in that time: A New Brunswick retailer paid a $3,600 fine in 2009 after a dozen of his 14 gas pumps showed significant measurement errors in his favour. Promised changes to the regulations have still not gone into effect. When they do, at a yet-to-be determined date, fines will rise to $10,000 from $1,000 for minor offences, to $25,000 from $5,000 for major offences and a maximum of $50,000 for repeat offenders. Though gas retailers currently undergo random tests, Measurement Canada has proposed mandatory inspections every two years. Consultations are currently underway on the proposal.